If you have ever said “I am just too old to do that!”…… think again! Age insecurity can be a stubborn mental block that prevents many individuals from achieving success. 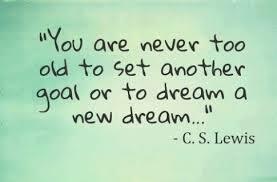 Are you letting the idea that you’re too old, hold you back? Take the quiz below and see these late bloomers who followed their dreams and accomplished tasks at an age when many would consider retiring! 1. Who won a first and only Academy Award two months shy of turning 81? 2. Which of these authors, at age 65, had a first novel published? 3. Who is the oldest tennis player to win the U.S Open doing so in mixed doubles at age 49? 4. How old was the oldest person to climb Mt. Everest? 5. How old was Benjamin Franklin when he was named the Ambassador to France? 6. Doris Haddock, who lived to be 100, walked from California to Washington D.C., between the ages of 88 to 90 to raise awareness of what? 7. What age did Grandma Moses (who lived to be 101) first begin painting? 8. Who was the oldest active congressman in history, serving to the age of 100? 9. Who, at the age 0f 45, became the oldest heavy-weight champion by deafeating a 26 –year-old? 10. Which fast food restaurant was originally finaced by the 65-year-old owners social security check? 11. At the age of 47, who is the oldest major leaugue baseball pitcher to throw a complete –game shutout? 12. Of the four Academy Awards won by Katherine Hepburn throughout her career, how many did she win after turning 60? 13. In what decade of his life was Frank Lloyd Wright when the Guggenheim Museum in New York was being finished? 14. How old was Nelson Mandela when he became the first democratically elected president of South Africa? 15. How old was Victor Hugo when his masterpiece Les Miserables was published? 16. Who is the oldest politician to win a major party nomination for a presidential election, having done so at the age of 73? 17. This woman was 97 years old when set a record for the 100 Meter Sprint at the USA Track and Field Eastern Regional Open Championships. She finished the race at 51.85 seconds, beating the previous record of 59.9 seconds for the 90 and over age category. She took up running at age 67 after several personal tragedies in her life, including the death of her husband and two of her sons.